After the commotion that Bicriu had stirred up at his feast, it was still left to be decided who was the rightful champion of Ulster, and who had claim to the Champion’s portion: Laoighre Buadach, Conall Cearnach, or Cuchulainn. Conchubar and his steward, Sencha, decided between them that they would take the question to the king of Connaught, Aillil, and his wife Queen Maeve, in their stronghold at Cruachan, and let them decide which of the warriors was deserving. So they made their preparations and readied themselves to set off for Connaught. Cuchulainn told Conall Cearnach that he ought to go first, because his chariot was so lopsided that it would leave a track behind that any man could follow for a year. Conall and Laoighre were cross with him, but they got into their chariots and set out on the road. Cuchulainn stayed behind to entertain the women of Emain Macha. He took their needles off them and threw them in the air, so that the tip of each needle went through the eye of the next, joining them all together in a row, and then he gave each woman back her own needle. Laeg, Cuchulainn’s charioteer, got very annoyed at Cuchulainn for wasting time. He called out to him; “You squinting idiot, they’ll both be at Cruachan already and the contest will be decided if you don’t get a move on!” So Cuchulainn climbed onto his chariot, and away they went. Cuchulainn had the two swiftest horses in the land: the Grey of Macha, who he had only just tamed, and the Black of Seanglan, and the two horses were so well-matched and so swift and tireless, and Laeg was so skilful in his handling of them, that they caught up to Laoighre and Conall before long, even though the other two were half way to Connaught by then. So Maeve instructed her people to open the gates, and had all her women go into the courtyard, some of them dressed, and some of them undressed, waiting with drink and food to welcome the heroes of Ulster. If they were coming with violence in mind, meeting them with gentleness and hospitality would be the wisest course. So Cuchulainn and the other warriors arrived to a warm welcome, bathed and given their fill of meat and drink. Queen Maeve asked if they would prefer to stay in one house together, or to have a house each, and they replied that they would rather stay apart. King Conchubar and the rest of the Red Branch arrived soon after them, and Queen Maeve and King Aillil gave them a magnificent feast. For three days and three nights they were entertained lavishly, and at the end of the third night, King Aillil asked King Conchubar what had brought him to Cruachan. Conchubar told them that he trusted no one but Aillil to make the judgement as to which of his three fine warriors should receive the champion’s portion of Ulster. Aillil grumbled that it was no favour to give this task to him, but he agreed all the same, saying it would take him three days and three nights to make his decision. The men of Ulster returned home, except for Cuchulainn, Laoighre Buadhach and Conall Cearnach, who each went to sleep in their separate houses. Queen Maeve set out from Cruachan and opened the side of a faery mound nearby, letting out three cat-shaped monsters, who went straight for the houses the Ulstermen were staying in. When Laoighre and Conall saw the monstrous cats come in, they jumped up into the rafters, and there they perched all night long, leaving the monster cats to eat all their food and destroy the rooms they were given. When Cuchulainn saw the cat-shaped monster, he struck it on the head with his sword, but the sword bounced off as if it had struck stone. Then Cuchulainn looked the cat-shaped monster in the eye, and the cat looked back at him, and they stayed that way, unblinking, until the morning came and the cats returned to the mound from where they came. Laoighre and Conall protested that this was not the sort of contest they were expecting: they were used to fighting men, and not monsters, so this did not count! Maeve said to Aillil that the difference between Laoighre and Conall was the difference between bronze and silver, but the difference between Conall and Cuchulainn was the difference between silver and red-gold. There was no contest in it at all. But Aillil was reluctant to make a judgement: whoever they picked, he said, the other two would be sure to turn on them. So Maeve told him to leave it to her. She sent for Laoighre first, and praised all his feats, told him what a wonderful warrior he was and how impressed by him she was. She gave him a cup of bronze with a little silver bird raised up at the bottom of it, and told him to say nothing to the others, but that when the Champion’s portion was given out in Ulster, to produce this cup as a token of his victory. Laoighre went away, very pleased. Then Maeve sent for Conall, and gave him a cup of silver with a bird of red-gold at the bottom to keep hidden till the time came in Ulster to claim the Champion’s Portion. 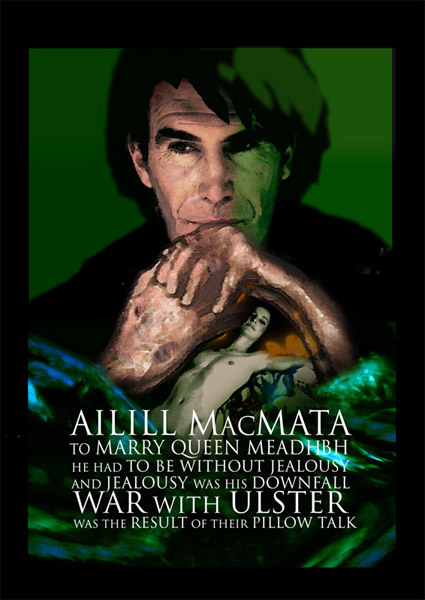 Then Maeve called Cuchulainn and gave him a cup of red gold with a jewelled bird at the bottom. As the three champions were preparing to leave, they saw the local youths in Cruachan were performing the wheel-feat. They had a chariot-wheel, and were taking it in turns to throw it into the air as high as they could. Laoighre took a turn, and threw the wheel up half as high as the wall. The youths let out a shout of laughter, but Laoighre thought they were cheering in approval. Conall managed to throw the wheel as high as the roof beam of a house, and the youths let out a jeering shout, which Conall took for applause. Then Cuchulainn stood up and flung the wheel high into the sky, catching it again as it came down. The youths gave a great roar of approval, but to Cuchulainn it sounded as thought they were mocking him. The three warriors returned to Ulster, and at the next feast, Laoighre presented his bronze cup, saying Maeve had declared him the champion, but of course Conall had his silver cup ready. The two began to argue, and then Cuchulainn showed his red gold cup, with the jewelled bird on the bottom, and declared that the champion’s portion was his. But Laoighre said that cup wasn’t won, but bought, and they almost came to blows again. Sencha had to separate them yet again, and this time he sent them to the house of a wise man called Cu Roi Mac Dara for judgement, first making them solemnly swear that they would abide by whatever judgement was given.